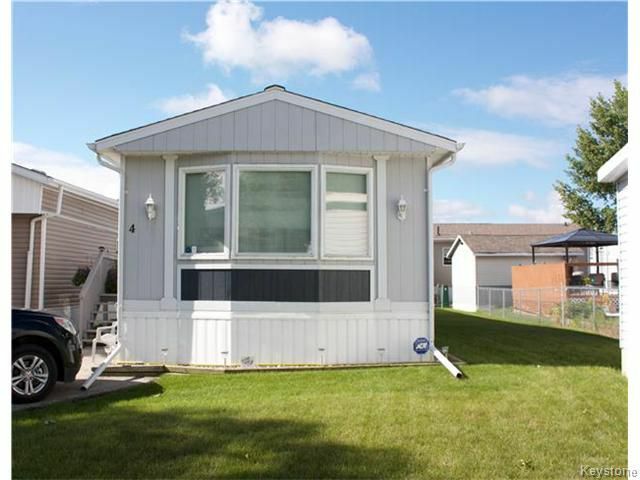 O/H 2-3:30 Sunday, Aug 28 This quality construction Manufactured home is a real standout when it comes to comfort, energy efficiency and durability. Built in 1999 this very bright and spacious 3 bedroom, 2 bathroom Bowes home features two skylights and an exceptional layout for families or singles with all of the bedrooms together at the rear of the home and the large kitchen and living room at the front! The home recently received an upgrade in insulation, and all of the water pipes were rewrapped for added protection during the cold winter months. Other features include newer eavestroughs and extended down spouts, upgraded underlay under the carpet, 2 steel exterior doors and a large bay window in the living room. A new superior grade central a/c unit was installed in 2015. Vinyl no maintenance exterior. Enjoy spending time with friends and neighbours at the pool or community centre. Lot fees are $505 per month and tax deductible. Call your realtor today to book your private showing.